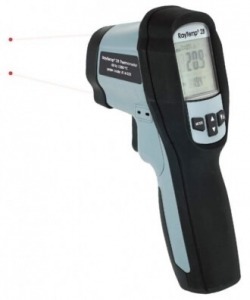 The RayTemp 28 is a professional infrared, gun-shaped, noncontact thermometer with dual laser dot alignment. The thermometer incorporates a 30:1 optic ratio (target distance/diameter ratio), which enables users to measure small targets from a distance or any item that is difficult to reach. It also incorporates a miniature thermocouple type K probe socket (probe not supplied) that enables a wide range of type K thermocouple probes to be used for a variety of temperature measurement applications, including air, liquid and surface temperatures. For details of compatible type K thermocouple probes, please click here.